Sometimes the future can be a matter of opinion. And in its 2019 Global E&P Spending Outlook, released Dec. 10, Evercore ISI projects a 10 percent increase in North American upstream capital expenditures. The boots-on-the-ground independents who responded to The American Oil & Gas Reporter’s annual Survey of Independent Operators aren’t so reticent, predicting a 22.1 percent increase in drilling activity from 2018 to 2019. Furthermore, two-thirds of survey respondents say they expect to drill more wells this year than last, while slightly more than half are planning larger drilling budgets. Category 1 respondents are those that plan to drill five or fewer wells in 2019. Category 2 respondents say they will drill 6-10 wells this year, while Category 3 respondents expect to drill 11 or more. Respondents included in the “oil” category drilled only oil wells in 2018 and expect to drill oil wells only in 2019, while the “gas” category includes all respondents that drilled any gas wells last year or anticipate doing so this year. AOGR mails its Survey of Independent Operators to producers nationwide selected at random from the magazine’s subscription list. No attempt is made to identify survey respondents, and AOGR staff compile and analyze the data. According to those data, survey respondents expect to drill 22.1 percent more wells this year than last (Figure 1), led by a 59.8 percent increase projected by Category 1 respondents: those who anticipate drilling 0-5 wells in 2019. Category 2 respondents (those that anticipate drilling 6-10 wells in 2019) are predicting a 43.2 percent increase, while Category 3 respondents (11 or more wells in 2019) project a 7.4 percent increase. Those that drilled, or expect to drill, oil wells only (“oil drillers”) predict a 24.2 percent increase this year, while “gas well drillers”–respondents that drilled any gas wells in 2018 or plan to do so in 2019–come in at a more modest 2.1 percent hike in planned drilling. Two-thirds of those responding to AOGR’s survey say they expect to increase drilling this year (Figure 2), while 14.6 percent expect to drill the same number of wells this year as last and 17.7 percent say they will drill fewer. Again, Category 1 drillers are the most optimistic, with 73.2 percent saying they plan to drill more wells this year than last. Category 2 drillers aren’t far behind, though, with 72.2 percent saying they will drill more, while exactly half of Category 3 drillers say they will drill more. Interestingly, more gas well drillers anticipate an uptick than do oil well drillers, with 77.3 percent saying they will drill more compared with 63.9 percent for oil well drillers. Spending plans also land in positive territory with 52.6 percent of survey respondents saying they anticipate larger drilling budgets in 2019 while another 38.1 percent say their budgets will remain constant (Figure 3). Only 9.3 percent of respondents say they will spend less this year. Size doesn’t seem to make much difference in this metric, with 55.4 percent of Category 1 respondents planning a budget increase, 50.0 percent of Category 2 respondents expecting to spend more and 55.0 percent of Category 3 reporting a planned increase. However, 78.3 percent of gas well drillers anticipate a budget increase in 2019, compared with 44.4 percent of oil well drillers, although another 44.4 percent of oil well drillers say their drilling budgets will remain constant. Not a lot of analysts project future rig counts, although in its Onshore Oracle for oil field services released Oct. 18, Evercore predicts the U.S. land rig count will grow 6.0 percent in 2019. In its November Oil Field Services Newsletter, Rystad Energy projects 3.0 percent growth in 2019 drilling worldwide. For the United States, Bryan Benoit, partner-in-charge of U.S. Energy Advisory for Grant Thornton, announced on Dec. 14 “indications that support rig count estimates (of) 1,100 in 2019,” which tops Baker Hughes’ Dec. 14 rig count of 1,017 by 2.7 percent. In other comparisons, 61 percent of executives in Deloitte’s 2019 Oil, Gas and Chemicals Industry Outlook report an anticipated increase in rig deployment in 2019, 56 percent project increased exploration spending and 52 percent project an overall increase in capital expenditures, although by unspecified amounts. Other generally positive outlooks for oil field activity come from the Federal Reserve Banks of Dallas’ and Kansas City’s third quarter energy surveys. In the Kansas City Fed’s survey, which was conducted between Sept. 14 and 25, 54 percent of respondents were anticipating an increase in drilling/business activity six months out while 43 percent expected no change. Half of the Kansas City Fed’s respondents expected increased capital expenditures six months out while 43 percent saw no change. The Dallas Fed, which conducted its survey between Sept. 12 and 20, found 65.4 percent of its respondents expected increased levels of capital spending in 2019, while 25.2 percent anticipated no change. The Dallas Fed surveys companies in Texas, northern Louisiana and southern New Mexico, while the Kansas City Fed surveys companies operating in Colorado, Kansas, Nebraska, Oklahoma, Wyoming, and portions of western Missouri and northern New Mexico. Of course, all oil field activity is driven by price expectations, and the predictions for 2019 crude prices generally range from $50 to $70 a barrel. “We expect oil prices to recover in the coming months, supported by Saudi Arabian and Russian cohesiveness, bottlenecks to North American shale production growth, and demand growth,” West said. He added that the operators Evercore surveyed quoted a West Texas Intermediate average price of $59.19 for 2019, well below Evercore’s own projection of $66.00 a barrel. In its Short-Term Energy Outlook released Dec. 11, the U.S. Energy Information Administration projects a WTI spot average price of $54.19 a barrel for this year, rising from $50.00 in the first quarter to $58.64 in the fourth quarter. For Brent, EIA projects an annual average of $61.00, rising from $60.00 in the first quarter to $62.64 in the fourth quarter. The agency points out that both those predictions are approximately $11 a barrel less than what it projected in its Nov. 6 STEO. On Dec. 14, Grant Thornton’s Benoit put WTI at “around $55” this year. A survey of 38 economists and analysts announced by Reuters on Nov. 30 predicted WTI would average $67.45 a barrel this year and Brent would average $74.50, with individual forecasts ranging from $57 to $90 a barrel. That was followed eight days later by S&P Global Platts’ survey of “top banks and oil brokers,” who predicted $75.50 Brent. AOGR’s Survey of Independent Operators was conducted between Nov. 26 and Dec. 7. Respondents indicate they based their 2019 drilling plans on expectations of a WTI spot price of $60.53 a barrel. There is a lot less variance in predictions of natural gas prices this year, which hover around $3.00 an Mcf and is exactly the price on which respondents to the Survey of Independent Operators say they are basing their 2019 drilling plans. 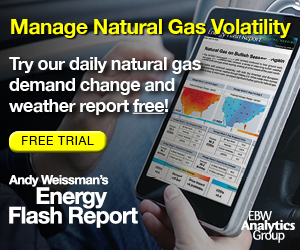 The bigger question is the impact of winter weather on short-term prices and gas storage. In a research update dated Nov. 14, Morgan Stanley observes that early winter cold had pushed gas prices to $4.00 for the first time since 2014. “The November-March outlook calls for 3,866 gas-weighted heating degree days (GWHDDs), placing winter 2018-19 firmly colder than both the 10- and 30-year normal,” Morgan Stanley wrote. “We forecast end-of-March (gas storage) inventories of 1.36 trillion cubic feet, below five-year normal levels of 1.65 Tcf. While it says it expects higher first quarter prices, Morgan Stanley puts its full-year gas price forecast at $3.00 an MMBtu. Similarly, an Oct. 17 report from Drillinginfo states, “Increased volatility and additional upside risk is expected if winter temperatures are colder than normal. Longer term, gas production is expected to increase to meet expected demand growth, with natural gas trading between $2.60 and $2.75 an MMBtu." A report from Bank of America Merrill Lynch Global Research suggests cold weather could propel winter gas prices above $5.00 an MMBtu. Kansas City Fed survey respondents pegged six-month, one-year and two-year forward prices (from September) of $2.89, $2.92 and $3.10 an MMBtu, respectively. Percentages in Figures 4A and 4B represent the cumulative total of survey respondents that indicate they would have altered their 2019 drilling plans by the time the spot price for West Texas Intermediate crude oil at Cushing, Ok. (Figure 4A), or the wellhead natural gas price (Figure 4B) reached the indicated amount. Prices at which drilling would decrease are plotted to the left of the graphs in downward curves; prices at which drilling would increase are plotted to the right of the graphs in upward curves. AOGR also asks its survey respondents at what prices for crude oil and natural gas they would increase or decrease their planned drilling activities. The needle begins to move upward for crude oil at $65 a barrel, at which point 15.5 percent of respondents say they will increase their 2019 drilling plans (Figure 4A). That number rises to 44.0 percent at $70 a barrel and breaks over 50 percent at $74. At $75 a barrel for crude, 69.0 percent of AOGR respondents say they will drill more wells, and 79.8 percent will do so at $80 a barrel. On the flip side, 28.9 percent of AOGR respondents say they will cut back their drilling plans at an oil price of $55 a barrel. This number balloons to 57.8 percent at $50, and by the time crude drops to $45 a barrel, 86.7 percent of respondents say they will drill fewer wells. For natural gas, the key inflection points are $4.00 on the upside and $2.50 on the down (Figure 4B). Whereas only about one-fifth of respondents to the Survey of Independent Operators say they will increase drilling at a $3.75 gas price, 43.2 percent indicate they will do so at $4.00 an Mcf, and 63.6 percent will drill more wells at $4.50. Should natural gas prices reach $5.00 an Mcf, 81.8 percent of survey respondents say they will drill more wells. Going the other way, 41.0 percent of AOGR survey respondents say they will drill fewer wells at $2.50 an Mcf. That increases to 48.7 percent at $2.25 and to 79.5 percent at $2.00. Evercore says 33 percent of its survey respondents indicate they will increase capex at a WTI price below $75, and another 33 percent (66 percent cumulative) will do so at $75. On the downside, Evercore says 28 percent of its survey field will reduce capex at a WTI below $50, while 34 percent (62 percent cumulative) will do so at $50 a barrel. For natural gas, Evercore says, “The average price that will prompt higher spending is $4.05 an MMBtu. However, operators expect to begin raising budgets at $2.00 an MMBtu, and a solid 50 percent will increase . . . around $4.45 an MMBtu. “Meanwhile, gas prices need to fall to $2.75 an MMBtu for budgets to begin revising lower. At more than 50 percent below the (mid-December) spot price, we do not see risk to natural gas budgets in the immediate term, particularly as a majority of respondents will not cut budgets until gas prices fall to $2.00 or less,” Evercore adds. Evercore says 38 percent of its survey respondents will increase capex before gas prices reach $4.00 an MMBtu and a cumulative 67 percent will do so at $4.00. Conversely, the firm continues, 43 percent will decrease capex before gas prices reach $2.00 an MMBtu and a cumulative 88 percent will do so at $2.00. In response to a new question added to the Survey of Independent Operators this year, 70.1 percent of respondents say they expect drilling and completion costs to remain constant through 2019, while another 22.7 percent anticipate an increase of up to 10 percent. Only 5.1 percent of AOGR respondents forecast a cost reduction, and 60 percent of those who do expect that reduction to be less than 10 percent. By comparison, Evercore says 7 percent of its survey respondents think costs will contract further in 2019, 52 percent anticipate stable pricing, 26 percent expect costs to go up 10 percent, 11 percent forecast a 11-20 percent rise, and 4 percent expect costs to increase more than 20 percent–the first time it has received that response since 2016, the firm reveals. Evercore picks labor, tubulars and transportation as the most likely sectors to lead price increases in 2019.